Dk-Lok:n valmistamat kierteelliset ja hitsattavat haponkestävät putkenosat. Kovartek Oy:ltä löydät ratkaisut vaativiin teollisuussovelluksiin. Pipe thread 1/8 to 1 in. Tube Socket Welding 1/8 to 1 in. Wrench flat body design allowing standard Hex. wrench assembly. Attractive finishes to suit precision equipment. Much less-weight design compared to Class 3000 pipe fittings. 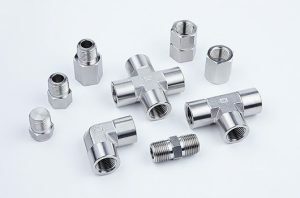 Fine pipe thread construction equals or exceeds the requirement of ASME B1.20.1 to ensure maximum thread engagement.Male pipe threads capped for protection from damages.